Dr. Ebonie Woolcock at Bowdoin Street Health Center in Dorchester, the neighborhood where she grew up. Woolcock, an obstetrician and gynecologist, also has a master’s in public health. Ebonie Woolcock saw her first cadaver during a summer science program when she was in high school. Far from being repulsed, she was entranced. “I fell in love,” she says. That teenager is now Dr. Woolcock, an obstetrician and gynecologist who recently returned to her Dorchester roots by joining the medical staff at Bowdoin Street Health Center. The circular path she took from her childhood in Codman Square back to the old neighborhood was one pitted with setbacks, but one that also taught her the value of perseverance — and role models. 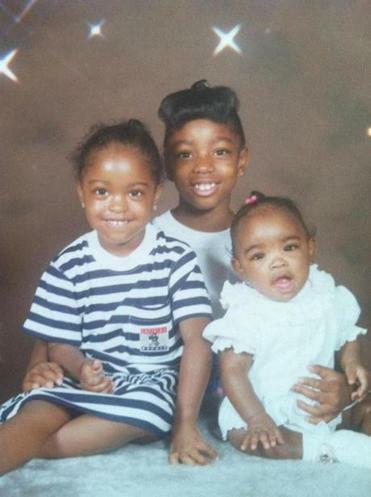 Ebonie Woolcock with her little sisters Yorkela (left) and Lejae (right). 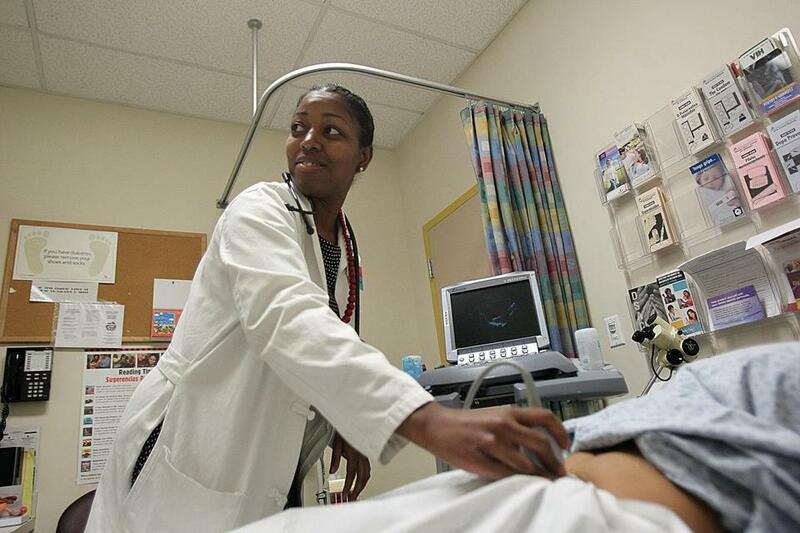 Indeed, minority students are sorely underrepresented in medical schools, according to Tour for Diversity in Medicine, a nonprofit that travels to traditionally black colleges to encourage students to consider going to medical or dental school. According to cofounder Alden Landry, an emergency room doctor at Beth Israel Deaconess Medical Center, blacks, Hispanics, and Native Americans make up 30 percent of the US population, but only 6 percent of practicing physicians. And that can be particularly true with physicians like Woolcock who overcame economic hardship and family tragedy. She was the daughter of a teenage mother who worked as an administrative assistant for the MBTA. Her father owned a small auto-mechanic shop. Woolcock’s mom was also the daughter of a teen mother, and she did not want that path for her daughters. The way out of the cycle, she believed, was education. There were no rewards for A’s on a report card; those were expected. Woolcock and her sisters participated in Metco, a state program in which inner-city children attend suburban schools. Its aim is to increase diversity in suburban schools while giving city students more opportunities. Woolcock attended Framingham schools from first grade through high school graduation, while her sisters went to Weston. 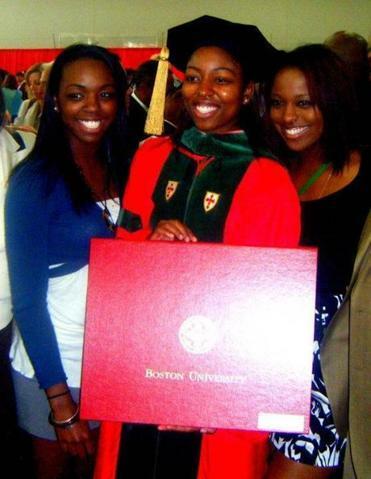 The sisters at Ebonie’s 2010 graduation from medical school; Lejae at right, Yorkela left. Woolcock was 19 when her mother, a nonsmoker, died of lung cancer at 38. Her sisters were 15 and 12. Their father had been deported to his native Jamaica a year earlier for reasons Woolcock says she’s unclear about. He died in 2008. That first year, the girls’ grandmother moved from Virginia to take care of them. After a Boston winter, she returned south. That’s when Woolcock became “Sister Mom,” as she calls it. After her mother was diagnosed, she had applied to the Early Medical School Selection Program at Boston University. The program works with 10 historically black colleges, including Hampton University in Virginia, where Woolcock was a freshman, and accepts them into both undergraduate and medical school. “I needed to be home to take care of my sisters,” says Woolcock, who took a year off from college. “We all kind of raised each other.” Her sisters went on to college too. One is an accountant in Hollywood, the other a teacher in Washington, D.C.
Woolcock graduated from Boston University School of Medicine in 2010, finished her residency in June, and was hired at Bowdoin Street, affiliated with Beth Israel Deaconess, where she delivers babies. “My first one as a grown-up doctor was Aug. 21,” she says, beaming. She also has a master’s degree in public health with a focus on community health and teen pregnancy. On a recent day, she sees a list of patients at the center, starting with a checkup on a woman who delivered a boy two weeks earlier. The patient speaks Cape Verdean-Creole, and there’s an interpreter in the examining room. Woolcock asks the patient about her mood, and the woman responds that the baby is fine, but she misses her teenage son, whose father put him “in a program for 45 days.” Now the boy won’t return home. There are tears, and Woolcock offers sympathy and a Kleenex box and suggests a future visit with the staff social worker. The advice seems to help. The community has embraced her. “I just want you to know I’m very proud to see you,” is a typical comment, she says. Woolcock has also gotten e-mails from other black doctors in the hospital welcoming her. Minter-Jordan knows that she — and Woolcock — could make more money in other settings. But both agree that giving back to the community that supported them is invaluable. “The jobs we are most successful at speak to us in a way that’s beyond dollars,” she says. In fact, when Dr. Celeste Royce interviewed Woolcock for the Bowdoin Street job, it was her interest in the neighborhood that set her apart. “She was so incredibly enthusiastic about coming back to Dorchester,” says Royce, who is the clinic’s ob-gyn director. Woolcock continues to seek her own mentors. After her residency, she started a two-year fellowship at the Kraft Center for Community Health. Every month, she and nine other fellows meet at the center downtown and get help formulating their goals. Through the Kraft program, she now has an adviser, a physician at Brigham and Women’s Hospital whom she checks in with regularly about her plans.